Starring: Ralph Fiennes, Tony Revolori, Saoirse Ronan and Edward Norton, among many, many others. Scott Rudin Productions, Indian Paintbrush and Studio Babelsberg. Inspired by the writings of Stefan Zweig with story by Hugo Guiness and Wes Anderson. Now a Golden Globe 2014 winner for Best Film, comedy or musical. From left to right: Paul Schlase, Tony Revolori, Tilda Swinton and Ralph Fiennes. THE GRAND BUDAPEST HOTEL is the story of a grand hotel and the adventure of its famous concierge. The story is told many years after the events took place, during the beginnings of World War II by the former hotel Lobby Boy and sidekick, Zero (played by Revolori) of the great M. Gustave (played by Fiennes). 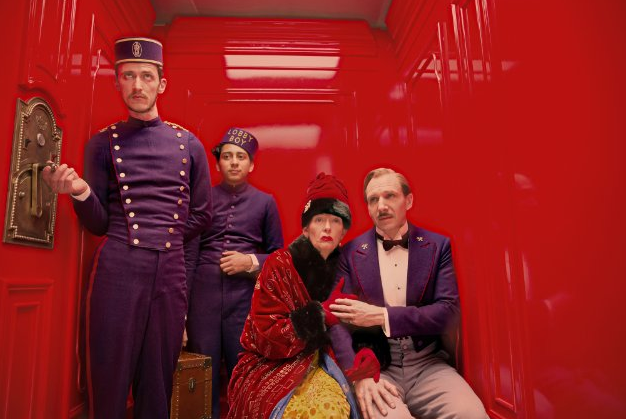 As is characteristic of Anderson’s other films, THE GRAND BUDAPEST HOTEL is a vibrantly colorful adventure with a strong ensemble cast. When I say colorful, I am not simply referring to the characters, although they are all rich and vibrant, I am also referring to the color used in the film by the director of photography and director. Anderson’s films are easily identifiable by his unique style, which includes a vibrant use of color, whimsical music, and a rather unique sense of absurdity. Absurdity is Anderson’s way of constructing satire. 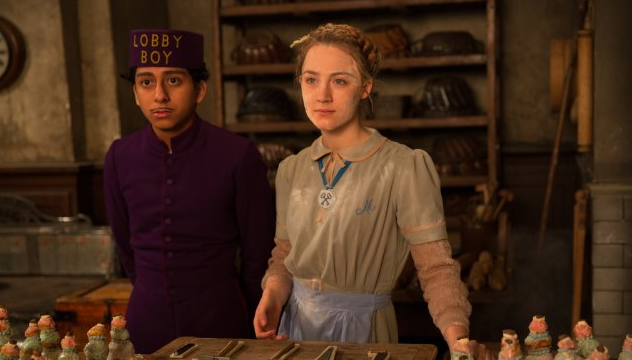 Tony Revolori and Saoirse Ronan in THE GRAND BUDAPEST HOTEL. The absurdity is emphasized by often dead-pan and genuine acting that emphasizes the grandiose and exciting plot. Sharp cuts and exaggerated details also help to create a unique auteurism in Anderson’s films. 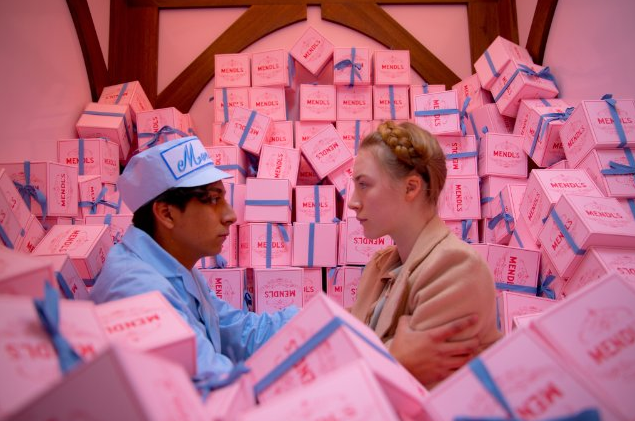 Unlike Anderson’s other films however, THE GRAND BUDAPEST HOTEL also confronts the contemporaneous World War II. Strangely, Anderson does not explicitly call out or name Nazis, however through his creation of a symbol worshipping, rising power in the former Austro-Hungarian Empire , it is evident that he is dealing with the Nazis. The Nazi power is not Anderson’s focus in the film, but simply an environment for his plot to take place in. 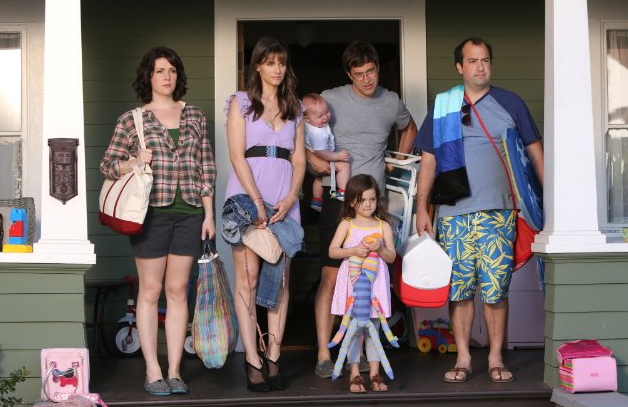 This film had a long list of wonderfully funny and tender moments brought about by an extremely talented and remarkable ensemble cast. Anyone who enjoys Anderson’s work will find a particular gem in his latest film. For those of you who would like a more thorough overview of the plot that contains spoilers but id absolutely wonderfully written, I would to direct you to the review in The New Yorker written by David Denby entitled “Lost Time- THE GRAND BUDAPEST HOTEL and THE WIND RISES”. This blog is essentially what it purports to be: my critiques on film, television, books, and whatever else I like, perhaps a little music, whether you want it or not. If you don’t want my opinion, I really don’t know what you’re doing here… Maybe you’re just curious or want to judge my judgement of these things, which I suppose is fine, too. I’m going to start this venture with the most recent film I saw: THE GAMBLER. Let me preface this review with the fact that half of the reason I went to go see this film is because I’m a big fan of the lead actors. If you know nothing about this film other than what you saw in the preview, you’re going into a film that you weren’t expecting to see. If you’re familiar with Mark Wahlberg’s work in the past, you probably think you’re going to see an exciting, heart-racing film about a good guy who owes a lot of gambling debts to some pretty nasty sharks. Well, honey, you’d be correct about the part that you’re seeing a film about a man who owes gambling debts to some nasty sharks. Unfortunately, it’s not packed with the action you expect from a Mark Wahlberg film. In the film, Wahlberg plays a clever literature professor who gets in over his head gambling in illegal casinos. Wahlberg’s character has taken on a massive amount of debt to a few very unfriendly people in order to help repay his debts, but even when it seems like he could repay his debts, he runs into a new problem. His character is a bit of an egotistical maniac and is the cause of his own problems; not one of which is seducing a supposedly genius student (Brie Larson). The is almost a retelling of Albert Camus’ The Stranger originally published in 1942, which, not so coincidentally, Wahlberg’s class is reading. The Stranger is a novel that utilizes an existential philosophy in its narrative. Existentialism is a philosophy which emphasizes the individual above all else. The individual is responsible for their own past, present and future. One must wonder if Wahlberg actually understood this concept or read the book this film was modeled after, as it doesn’t seem as though he knows what he’s talking about throughout the film or what his real purpose is. He get’s the egotistical part correct, but he does not seem to connect the meaning of his words with how he is saying them. During parts of the film, I actually had trouble following what Wahlberg was saying, not because I did not understand the words he said, but because the cadence of his words did not make sense with what was actually being said. It was as if he were speaking a different language that he did not understand, but knew how to read. Put another way, it seemed very possible that the director told Wahlberg exactly how to say the words, but because he did not understand them, he was unable to emote the feelings behind the words. Although this film was a clear hope at trying to get awards nominations for Wahlberg, this particular film did not garner the desired attention for Wahlberg’s abilities. The other casting choices did not feel as disconnected and the performances were better than Wahlberg’s, but did not redeem the film. John Goodman has worked on several Coen Brothers’ films and demonstrated his ability to perform complex characters in supporting roles, stealing the show. He has also demonstrated an understanding of complex literary characters and themes through these performances, which is why he was likely attracted to this project to begin with. Brie Larson, a gifted and talented actress, plays an undeveloped female who is developed exclusively by what the audience is told about her and not by what she actually does and says. This is a tragedy for many characters in films, but it is extremely evident in this one, where the audience has to go off of Wahlberg’s word when he says she is a genius. Jessica Lange plays Wahlberg’s mother, and although her performance is short, it is extremely well done. She is able to convey so much emotion and power through her countenance, speech and expression. Michael Kenneth Williams, although I haven’t seen him in anything else, also has a memorable performance. At his entrance, most of his speech is some gambler language, which I profess, I did not fully understand, but he made it intelligible to the non-gamblers amongst us through his body language and slight manners. The film, on the whole, embodied the existential philosophy and narrative form very exactly, until the end, which I won’t spoil. For me, however, the existential philosophy is extremely egotistical and selfish, thereby making the protagonist a very unsympathetic character. Since the film is a character driven story as opposed to an action driven story, this is very important. The focus of the director, camera movement, and the situations which are characteristic of an existential piece, were all very in line with the film’s content, and interesting to watch, however, in big part because of the actor, they didn’t carry the weight they should have. In one scene, Larson and Wahlberg go to the desert; they are small in frame compared to the vast expanse of rock and sand and land, but the acting and script don not do anything to emphasize the smallness of the characters in this scene. There is another scene, where Wahlberg lies in a bathtub under the water, presumably contemplating himself, the situation he is in and how to get out of it, but none of this comes across in his performance. It is only to be assumed by the situation, which we have all seen before. In all, the film is lackluster and not what I had bargained for. Although some of the performances are worthwhile, they do not outshine a rather unfortunate performance by an unsympathetic protagonist. And while the director, Rupert Wyatt, seems to take all the traditional steps to try and portray his vision, the film felt like it was doing just that: going through the motions of what an existential film is supposed to be and not what it could be.